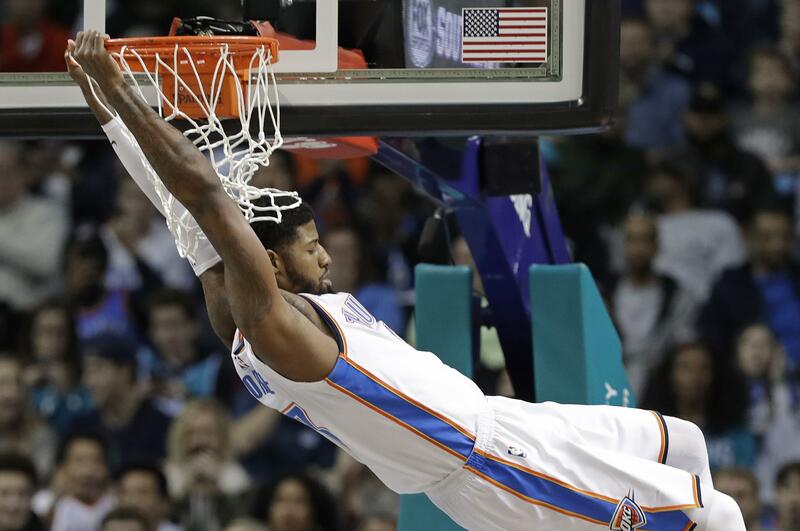 UPDATED: Thu., June 28, 2018, 5:44 p.m.
Paul George turned down one option and created a slew of new ones. George has decided not to exercise his $20.7 million option for next season with the Oklahoma City Thunder, a person with knowledge of the situation said Thursday. George will become an unrestricted free agent on Sunday. The person spoke to The Associated Press on condition of anonymity Thursday because neither George nor the team has publicly announced his decision. ESPN first reported George’s decision about the option year. It was not an unexpected move for George, who averaged 21.9 points, 5.7 rebounds and 2.0 steals for the Thunder this past season. By not opting in to the final year of his existing deal, George opens up an array of possibilities – such as going elsewhere, possibly the Los Angeles Lakers, or signing a new deal with Oklahoma City. He is also expected to be pursued by the Houston Rockets, who finished this past season with the NBA’s best regular-season record. George may opt to sign a short-term deal, either with the Thunder or someplace else. He could also command as much as $176 million in a five-year deal if he chooses to stay in Oklahoma City and pair up with Russell Westbrook for years to come. He will be one of the headline attractions, along with LeBron James, when the free-agent shopping period officially opens at 12:01 a.m. EDT on Sunday, assuming that James chooses not to exercise his $35.6 million option for next season with the Cleveland Cavaliers. The Thunder have long maintained that they want to keep George, whom they acquired a year ago in a trade with the Indiana Pacers. George is a five-time All-Star who just turned 28. For his career between Indiana and Oklahoma City, he’s averaged 18.6 points and 6.2 rebounds while connecting on 38 percent of his tries from 3-point range. Presti gambled a year ago by trading for George and Carmelo Anthony to join Westbrook in hopes of rejoining the NBA’s elite. It didn’t quite work out – the Thunder lost in the first round of the playoffs for the second straight year. Anthony has exercised his $28 million option to stay with the Thunder for next season, doing so while insisting that he will not accept a role where he comes off the bench. But George has said he sees potential in Oklahoma City and seemed to enjoy pairing with Westbrook; the Thunder went 40-22 in their final 62 games of the regular season and got the No. 4 seed in the Western Conference. The question now becomes, was it George’s only year there? The Thunder will soon find out if that’s enough to keep him. Published: June 28, 2018, 10:32 a.m. Updated: June 28, 2018, 5:44 p.m.